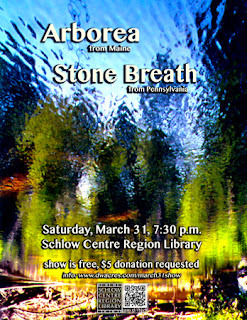 Saturday, March 31, 2012 Stone Breath will be playing live with Arborea in State College, PA. Information HERE. I believe the wonderful Carin Wagner Sloan (ex-Iditarod) will be joining us for a few songs which is great news! Hopefully our live appearances will become increasingly less rare, now that there is a local and regularly practicing membership. On that note, Stone Breath is looking for shows - so contact me if you have anything for us. O yes: If you are on Facebook, please "like" Stone Breath. You can hear some of our music and get more information at our ReverbNation page...and if anyone remembers MySpace, we have some music there as well.